Hi Mike, had to comment out the test UART to get it to compile as simple_uart.vhd is missing in the source zip. Thinking about adding disk controller support as it aligns with another project that was on the back burner. Nice work. Thanks for the heads up – the project is managed in a git repository and I never recompiled it after I did the export. I will upload a fixed version when I get chance, although it isn’t a necessary part of the design as you discovered. where the reset value is 15'b100000000000000. Hi. Thanks for the fix. The 76489 block was just lifted from FPGA Arcade and it does need some work (it fails timing on Altera). I was aiming to rewrite it at some point and I’ll make sure the tap positions get updated. Nice work. Could you drop me a mail, I would like to merge your bug fixes pack into the FPGAArcade code if you don’t mind. I am also bringing up your design on the new Replay board which is fun. Hi Jason. The CRTC model doesn’t implement v_total_adjust, so the frame length is going to be slightly shorter than it should be. Although the CRT TV I was testing on had absolutely no problem with this, I can imagine it could upset a flat screen. There are also no serration pulses – just a half line VSYNC delay. Nice work on the PAL encoder. Is it open source? Hi Mike. I’m guessing it’s one of these two. Maybe I’ll try to add those bits in. Yes, my composite stuff is based on the open source Joerg Wolfram fbas_encoder and scoops the RGBHV directly from the Video ULA and needs a 32MHz clock. I was going to make a patch which was run-time switchable but there are no dev board switches free so mine drops your existing output scheme. It also occured to me that the video ULA could be tweaked to give proper 16 colours in mode 2 as we’re not limited to TTL RGB monitor. First can I say what a remarkable achievment. I compiled the code tonight. loaded the roms to flash and it works!! I have a problem thou. On the monitor I have, the video blanks at an interval of around 1s. Im guessing at this early stage it’s a timming issue. I can run games such as Arcadians and they don’t crash when the display wobbles. I tried on an older crt monitor and it won’t sync at all. Any ideas where I should investigate? I’ve also run your spectrum and It’s ace as well. Hi Graeme. You’re not the only one having timing issues with the video, which is strange because it was rock-solid on both the CRT and LCD that I tested it on (the video is shot from an LCD), although as was often the case with 80s computers, the timing isn’t bang-on BT.601. You aren’t trying to run it into a VGA monitor are you? The Spectrum design has a scan doubler, but the BBC doesn’t so it needs a TV. That explains that then. Yes that’s what I’ve done. I just hooked it to the PC input on my telly. I’ll wire it to the scart input and let you know how I get on. Thanks. I managed to get this up and running on the Digilent Atlys. Also having issues with the video. Seems the LCD monitor is not very happy when in mode 3,6 and 7 but is fine in other modes. In order to get it working in the other modes i had to use a 640×512@50Hhz signal using the following modeline.. I then used this pixel clock as my base clock. Mike, quick update. I’ve investigated and found that in modes 3,6 and 7 the 6845 model is not inserting the blank scanlines. This means that the VSYNC pulse is getting sent around PAL scanline 599 on those modes instead of scanline 623 on the other modes. I’ve not seen anything in the code yet that explains it but that would be why many people are reporting problems with syncing. Also it means that the machine doesnt get enough CPU time per frame for some of the more exotic games. I spotted this because i’m having to convolve my signal onto a DVI carrier as the Atlys doesnt have VGA. Just HDMI. Wow – just discovered this and your speccy project! Looks like you’ve done some impressive work – more than my half-completed efforts! Nice! Also had no idea there was a PAL/NTSC core… my colleague has been working on one and is almost there… he’ll be interested in that no doubt! Mike, i’ve managed to get this working lovely on the Digilent Atlys. Here are a couple of videos of it working. Excellent! Is that running on a PC monitor, and if so did you implement a scan doubler, or modify the CRTC? Minor modification to the CRTC.. I needed to stop the half line phase shift on alternate frames. I basically write a byte to a fifo on every vid_clken, when the fifo has 4 bytes i write that to DDR ram (via Xilinx MIG). The reading bit is trickier but it does scandouble although i havent done the deinterlace properly yet. Thats only *really* important in mode 7. Its outputing via HDMI on the Atlys but it could easily be modified to output to VGA on something else. I’m now working on getting a Tube interface working. I’ll keep you updated. After a fair bit of messing about i have a working tube model that is compatible with your FPGA setup. 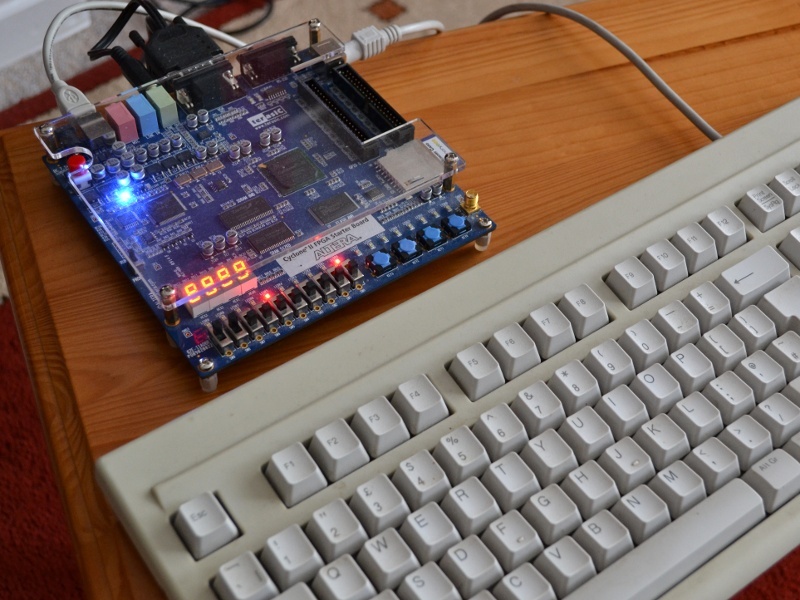 Using it will require an FPGA capable of running a second 65C02 and will need 2K rom + 64K RAM. the major bonus is that we get more ram space free for basic programs. Send me an email Mike and i’ll send you over the code i have. current version uses a Xilinx FIFO but im sure we can invent something for the Alteras. Latest tube model emailed to you mike. Everything seems to work ok except 2nd processor elite. Need to investigate why that is crashing. Thank you for publishing this great project! I have got your BBC design working on my DE1 board -except the display. I can tell the BBC is booting and running ok by typing SOUND commands, ‘ blind’ However, I don’t quite understand how you have connected your SCART cable. Could you describe the pin connections VGASCART a bit more please ? Did you use a commercial cable for that, or did you make your own ? Thanks! The grounds don’t have to be separate. I will try to find time to check this tomorrow and draw a diagram. Can you try the following for me on your FPGA model. This seems to cause a hard interrupt lock up for me about a 10th of a second after i do it. This is whats breaking elite tube for me. BBC beeps and seems to respond to keyboard, but I’m getting no display on two monitors and two TVs via various cables :sad:. Any way you can build in a switch for interlaced/non-interlaced video ? Otherwise, getting a display from this thing seems to be a form of masochism. I think there’s a VDU command to do that, which shouldn’t be too hard to type blind. You mentioned monitors – you aren’t trying to feed it into a VGA input are you? 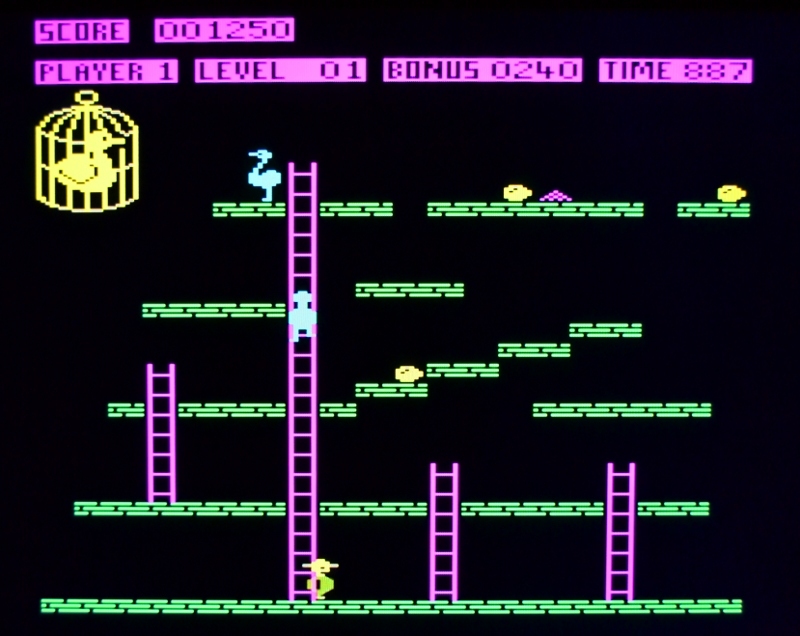 Unlike the Speccy, the Beeb design doesn’t include a scan doubler so it will only drive a PAL TV/monitor for now. You need to make a VGA to SCART lead like the one for Minimig. Thanks for the heads-up. For some reason I was under the impression that it actually got released under that name outside the UK, but according to wiki it was simply known as the “British Broadcasting Corporation Microcomputer” to avoid a possible trademark infringement on the acronym. I downloaded the HDL today to get this running and it compiles under the latest Quartus. I have been trying to find a Scart Lead to doctor without success :(. I see Stephens great improvements including the Tube 😀 A these available to download? Is there a scan doubled version for the DE1 yet so I do not need to make the lead? Great work by the way. I would like to port this HDL to the Parallella board when it is available and have a Cortex A9 as a second processor to make the fastest BBC micro in history!!! Hi Simon. I think I have Stephen’s Tube code somewhere, but I never ported it, and I guess you want the scan-doubler first. Maybe he’ll pop up in response to this comment! There’s a DE1 scan-doubler in Minimig which might work, but I’m afraid I haven’t done anything more than you see in the archive. Yes. See earlier comments by Stephen, who ported it to the Digilent Atlys board and added a scan doubler. Not sure if he published the HDL, but I could pass on a message to him if you can’t find it. I’m interested in getting a copy of the BBC Micro code for the Digilent Atlys board. Do you manage to get a copy of Stephen’s code or do you have details of how I can contact him please. Has anyone tried changing hsync timing with this setup to move the picture horizontally? There were a few demos on the beeb that used it: 3d pool 1000 scrolls by orlando and tricky’s rally-x demo on star dot. I was thinking that it would be good to handle the horizontal shifting in the 6845 emulation and produce a normal hsync so that the h-scrolling would work on new tvs/monitors. Do you have any details of the timing changes? It should be straightforward to, for example, clamp the hsync to a fixed length and move the extra to front/back porch instead. This should work ok with a modern TV as long as the overall line lengths remain the same. I don’t really have any time to look at this at the moment unfortunately, but it sounds like an interesting one. For each decrement of the h-sync pulse width, the picture on the screen moves right by half a character and vice-versa. You can only change it by a few values before it won’t work on some CRTCs. The default width doesn’t work on some CRTCs. You only have to EOR #1 the width, but you do have to blank half one side or the other to stop the sides juddering. On a real CRTC, it takes a variable number of scan lines (roughtly 8) to align to the new value, but B-Em does it immediately, which works better in some cases, except when you are trying to create waves scrolling up/down the screen. I first thought of creating an RGB to HDMI FPGA based converter incorporating this functionality and possibly additional features such as reprogramming the 8/16 palette colours by changing the h-sync pulse width during the “off-screen” time as a slow serial communication. I haven’t checked if the h-sync pulse width is even transmitted during this period and have never written any VHDL, so I don’t know how feasible this is. The Vic chip mod that adds a C64 sound chip to the beeb – some games have been moded to use this. The border colour mod that allows the border colour of the screen to be set IIRC uses &FE22, but I could be wrong – used for timing during development (not sure if this is in b-em). The windows version of B-Em is the most accurate emulation of most things beeb related that I have found. I’ve managed to get your design working on a Pipistrello board – http://pipistrello.saanlima.com. This has a Xilinx Spartan 6 LX45 on it. I have changed ROM and RAM to work internally within the FPGA . I have it working but for some reason when I run Elite about 20 pixels or so of the right hand side of the screen wraps over to the left. I.e the right hand side vertical line of the box is missing and appears next to the left hand box vertical line. I’ve played around with all the 6845 and Video ULA settings I can think of but this makes no difference or is just much worse. I’m wondering whether it could be anything to do with the RAM timings ? Which is a strange thing to focus on but its the only real things I’ve made any changes to i.e because its now internal block ram rather than external. For example I needed to change the following section to work with the internal Block RAM and the vid_clken needed to be ‘0’ instead of ‘1’ to get it working at all. I’m a complete newby and all of this is probably very unhelpful but if you could give me any idea as to why Elite is wrapping like this that would be great. Other games generally look ok. I’ve also added a video converter so it works on a VGA display and the same problem occurs. This great core has finally also been ported to the MIST board. This now includes a scan doubler for VGA compatibility and the ability to use analog USB joysticks and gamepads. Thanks for this great core! Hello mike, Can you help me ? I want to implement your project, but don’t know where to start. estou começando agora, sou universitário. Hi Rodolfo. You will need to obtain a suitable FPGA board first. There are newer versions of the Terasic Altera boards which you should be able to get cheap if you are at university, and the project has already been ported to a number of other boards including some Xilinx based ones (see comments). Here we use Altera DE1 Terasic, downloaded the codes compiled and played on the board, the roms downloaded and copied to the SD card still did not work, please help me. The ROMs need to be programmed into the flash chip on the board, not on the SD card. You can program the flash chip using the Terasic demo software that comes with the board. Sorry but I did not, I’m totally lost, that told me is a ferramento the quartus sofware? Thanks Mike for the great work. Thanks for the heads-up Simon. I don’t really have the time to play with this stuff any more, so I’m really pleased to see others have picked up where I left off. I had a quick look at the thread on stardot and was particularly taken with the MODE 7 stuff – the character rounding looks excellent!